Why early success means continued success in publishing. Simple. Enough pre-orders give a book a big boost on the best-seller list the week it officially becomes available. Here’s how it works. More positive reviews. More sales mean more reviews, and if the book is good, more good reviews. More good reviews lead to more sales. Greater visibility. When a book is selling well, potential readers see it on the best-seller list, whether it’s The New York Times or Amazon. That could mean placement on Amazon’s list of Hot New Releases, or a solid blurb in Publishers Weekly. More interviews and press. A book on the best-seller list, even if only for a week or two, generates more interview opportunities for an author. The book will probably be written about more online and in print. Both, of course, increase the likelihood of sales. And all of this good fortune begins with a good run of pre-orders. The best news is that this is now true for just about every book. Not so long ago, only traditional books benefitted from pre-order. Self-published books simply weren’t eligible to be pre-sold. As the author, you hit “Publish” and a few days later your book was ready, and then readers could happily buy it. Now, self-published books can also have a lengthy pre-order period. This means on the day it’s released, it can land way up on Amazon’s best-seller list, too. And, as point number one says, that can lead to way more sales. So, it’s true. In publishing, early success leads to continued success. If book one sells well, a publisher is much more likely to put out book two. Soon, that author might even have a career. But it starts with you. If you’re going to buy a certain book anyway, or support a certain author, or you want it shipped to you the day it’s released, or you just want to help out an author (maybe even your favorite author), then order it early. Pre-orders can make or break a book launch, and a bad launch can break a book’s success. So, don’t wait. Your pre-order can be a huge help to an author’s career. You just might put him or her on the best-seller list! John Briggs is the author of Leaping Lemmings!, a picture book about a lemming who won’t jump off cliffs with his friends. It’s currently available for pre-order before its September 6 release. If you want to help your young reader learn to think for him or herself with a funny book about an independent lemming, order your copy today. Thanks! Hello John! Per your earlier permission, I scheduled this article to be featured on http://www.ryanlanz.com on May 26th. As usual, it has your credit/bio/link. Thanks! 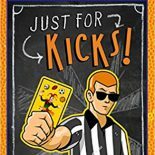 This entry was posted on March 16, 2016 by johnbriggsbooks in Book Marketing, Books, Children's Books, Picture Books, Publishing, Uncategorized.